There are three main types of cough: acute, subacute, and chronic cough. If your cough persisted for less than three weeks, you had an acute cough which resolved. Coughs lasting more than three weeks but less than eight weeks are considered subacute. Post-viral coughs are considered subacute. However, if you have a cough that has lasted more than eight weeks, your cough will be considered as chronic. Have you ever started coughing when you felt someone was wearing too much cologne or perfume. Or maybe you have post-nasal drip and have been coughing ever since. Coughing is ultimately a reflex that can be triggered by both mechanical and chemical receptor stimulation. While commonly attributed to the upper airways, the cough reflex can be triggered in the: upper and lower respiratory tract, pericardium (heart tissue), esophagus, diaphragm and stomach. Mechanical receptors cause a cough when they are touched or moved. Chemical receptors respond when exposed to changes in temperature, exposure to acid, or substances like capsaicin which we recognize as spicy. Receptors around the larynx, trachea, and bronchi, can be triggered by both mechanical or chemical means. When either mechanical or chemical receptors are activated, you start coughing. Following a common upper respiratory infection, as many as 25 of every 100 people will have a persistent post-viral cough. During this time, you will not be contagious but will have a nagging cough that may or may not affect your daily activities. If you acquired a fungal or bacterial upper respiratory infection like Mycoplasma pneumoniae or Bordetella pertussis (whooping cough), your risk increases to between 25 and 50 percent. Post-viral coughing is more common in the winter months due to the seasonal increase in upper respiratory tract infections (URIs). Young school-age children are most affected with an average of seven to 10 URIs per year. While adults only experience about two to five bouts per year, the risk is not significantly different for either children nor adults. 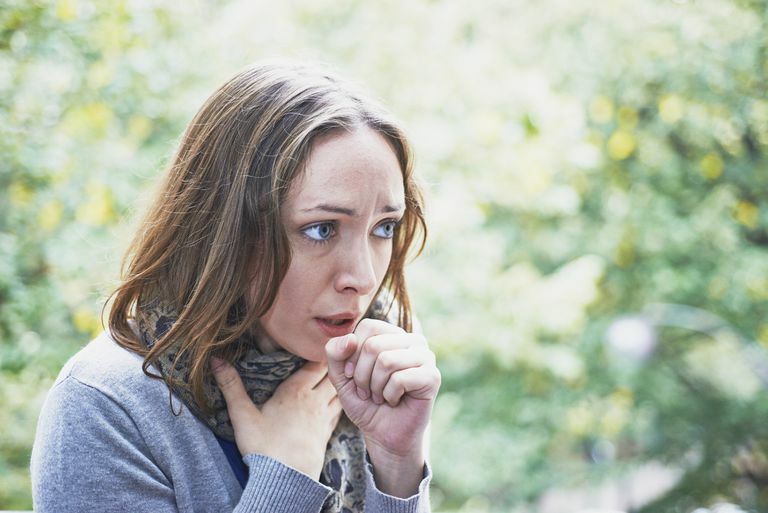 The reason that you maintain a cough after an upper respiratory tract infection remains unclear. However, it is believed that remaining inflammation and compromised upper or lower airway tissue (epithelial) integrity from the cold is responsible. In most cases, you won't need to see a doctor if there are no other symptoms. The only exception may be if a cough persists for more than eight weeks or becomes productive (a possible sign of walking pneumonia). Under normal circumstances, you will not need to receive a diagnosis of a post-viral cough if you have recently had an upper respiratory tract infection and have had a cough that has not persisted longer than eight weeks. However, if you are having problematic symptoms that are affecting your quality of life, you will want to see a physician. Your doctor will take a thorough history including onset of your cold, as well as characteristics of your current cough. Your doctor will likely not have to test you for each of these other causes. They will determine if any of these should be tested based upon their medical exam and your medical history. Without treatment, a post-viral cough will resolve on its own. However, if your cough is significantly impacting your quality of life, you may find that the resolution time between three and eight weeks to be too long. If that is the case, you will want to see a physician for symptomatic treatment. In order to properly treat you, your doctor will need to determine whether your post-viral cough is due to post-nasal drip (now referred to as upper airway cough syndrome) or if it is directly related to inflammatory or cough receptor changes from the viral infection. A cough related to upper airway cough syndrome (UACS) involves the same treatment as if you were diagnosed with nonallergenic UACS. As the first line of treatment, your doctor will prescribe a first-generation antihistamine like brompheniramine, clemastine, or chlorpheniramine. While more sedating than newer drugs, they are more effective at minimizing a post-viral cough. A post-viral cough without UACS is directly related to changes in the airway tissue and cough receptors from your viral infection. Treatment for a post-viral cough is similar to the treatment of asthma. If your testing does not show bronchial hyperreactivity, it may be useful to trial a course of ipratropium bromide (Atrovent). Atrovent has shown to be successful in post-viral resolution when cough variant asthma is not suspected. Braman, SS. (2006). Postinfectious Cough : ACCP Evidence-Based Clinical Practice Guidelines. Chest. 129(1 Suppl):138S-146S. Hughes, J & Shield, MD. (2009). Non-specific isolated persistent cough. Paediatrics and Child Health, 19(6):291-293.